The excitement of the second show of the season exploded from Pershing Park in Racine, Wis., on Friday evening. According to DCI Midwest division coordinator Roman Blenski, this historical drum corps site showcased American Legion corps right after World War II -- metal helmets and all. 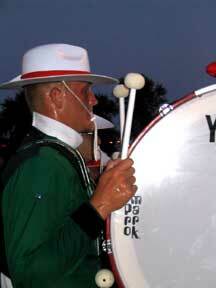 The Madison Scouts' bottom bass exits the field in Racine on Friday. The Madison Scouts took first place with a 68.75, and according to contra age-out (and two-year veteran) Mike Hyslop, it was good for the corps to get in front of a crowd instead of just their staff. "During the beginning of our show, we turn backfield, and I was facing Lake Michigan. It's definitely something I'm going to remember all season," he said. One member of the Kilties (senior corps) color guard commented that the grass was a little wet and slippery as she ran towards the front sideline for an equipment change, but overall the weather was great for a drum corps show. The Blue Stars from LaCrosse, Wis., started the evening off with their program entitled "Visions of Blue," and scored a 45.85. "It was a pretty good show for a second run. I can't complain. There were no major tears," said Jeremy Basso, a member of the brass staff for the Blue Stars. The Colts, who took second place with a score of 65.10, ended the show with a powerful jazz piece allowing all members to let loose and perform in the early season. According to Carla Burgess-Tomsa, the Colts' color guard caption head, "This show was better than the first and the members are becoming more confident," Burgess-Tomsa explained. The sassy jazz piece includes an ensemble jazz dance feature by the color guard with the horns and percussion blasting the jazz sound. Burgess-Tomsa said the corps is looking forward to the show's ending piece, which will tie everything together. A fan in the audience, Elaine Danish from Greendale, Wis., said that she enjoys everything about the activity and the performances. "I've enjoyed music all my life," Danish said. "I wanted to be a part of one of these [corps] all my life but I never got there." Elaine and her husband came to watch their granddaughter perform with the Kilties, Sr. corps, who scored a 41.5 that evening. The Racine Scouts performed in exhibition, featuring music from James Bond movies.